I had never, ever heard of family worship or family centered worship until about three years ago, when totally hip young mom (that I've known since she was a sophomore in college) mentioned it on her blog or facebook page. I recall thinking, "good luck with that!" As a family, we have always done whatever was the norm in the church we were attending. For the past 11 years, that has been to have our children with us during the song part of the service, then sending them to their age-appropriate children's ministry program during the sermon. Now that Luke and Ben have aged-out of those programs, they sit with us for the whole service, and Levi attends a Junior Worship program. This is just normal for us, and I never thought much about any other variation for worship. I'm not sure I'm seeing much "fruit" from our decision to just "go with the flow" of having our kids participate in only half of a worship service. I fear that we've sent a message to the kids that they are now "forced" to sit through a sermon because there is nothing else "to do." In the past two years, we've really tried to draw Ben's attention towards the pastor's message by having him focus on the outline notes our pastor provides in the bulletin; usually, this hasn't worked. We've encouraged (ok, demanded sometimes) better attention during corporate worship from all the boys -- stand up, look at the screen, follow along with the words of the songs. And would you stop drawing ballistic missiles! I'll admit, I often feel like a dictator. It hasn't always been pretty and it leaves me longing for more. More help. More direction. More patience. 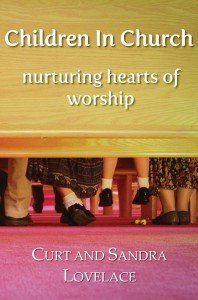 Published by Great Waters Press (listed for $12.00 for the advance copy with free shipping as of this post), this book provides a guide for transforming your thoughts about how to worship with your children. Or, if you already have felt the nudge to incorporate your children into Sunday worship, you will be encouraged by real life stories from the authors, suggestions and scripture. The Lovelace's couch their thesis that children should be a part of the corporate worship service (and not sent to age-appropriate rooms and classes) with Old and New Testament scripture, from Moses on through to the Disciples. They build a convincing argument that God intended for families to train up their children in the presence of a multi-generational corporate body of believers. Drawing on their years as a young family without children traveling the world and experiencing worship in lots of different places, the Lovelaces outline their own journey towards understanding corporate worship as a family. They also share their experiences of trying to practice their ideas of family worship within a fairly traditional American church, where children go to their classes and adults attend worship. They certainly sound like trailblazers on this journey. I really appreciated the middle portion of this book, which gave pointers, hints and opportunities to "count the cost" of pursuing a season of family worship. In most chapters, the Lovelaces share stories of themselves (well, Sandra mostly since Curt was at the pulpit preaching) shepherding and training their children to worship through the service. They also include other stories of Sandra truly blessing other children in their congregation. For one reason or another, Sandra took the child under her tutelage and helped the child develop a real heart for the Lord and for worship. What I love best about these stories is that they are not perfect. The Lovelaces share some of the struggles and challenges they had during this season of life. (Sandra, thank you for being vulnerable and sharing some of your discouragement!) The transparency of their journey gives me hope! Is this book a little too late for us? After all, I have a 13 year old, almost 10 year old, and almost 7 year old. Although the Lovelaces do not specifically address this, I do not believe we are (completely) too late. After all, the Lord of Lords is on our side. This resource would definitely be perfect for and those with toddlers and preschoolers. But, I do believe that -- with prayer -- we can modify some of the suggestions Sandra and Curt make and use them during different parts of worship with our kids, especially since two of the three sit through the sermon on a weekly basis. And now that I've read this book, and have an arsenal of ideas (Church Bag, colored pencils and drawings will play a big part of this), I'm hopeful that I can engage my youngest incorporate worship. Disclaimer: As a member of the TOS Crew, I received an advance copy of this book no cost to me, in exchange for my honest review. All opinions are mine.